The couple’s faith teaches them they’ll meet Bryon Dickson II again one day. 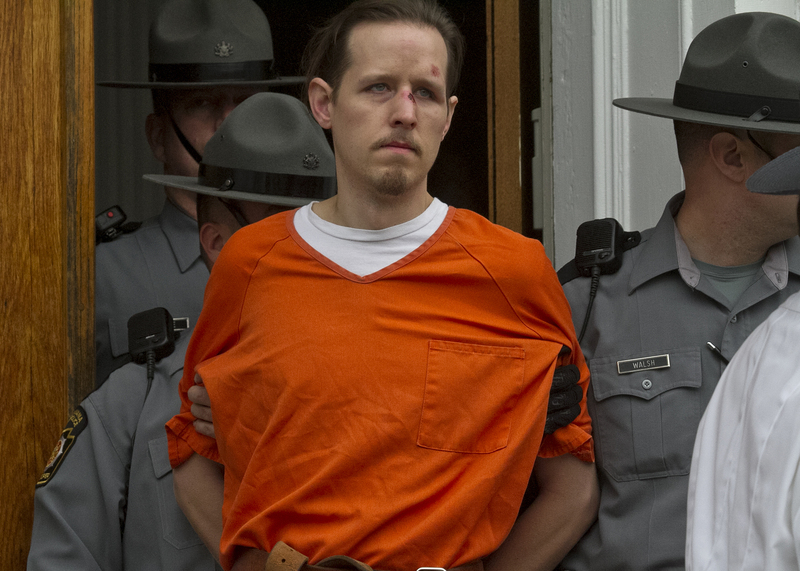 Until then, they seek a measure of justice for their son when a jury considers capital murder charges against Frein, 33, the anti-government survivalist whose trial opens Thursday with jury selection. Frein has pleaded not guilty. His lawyer did not return messages seeking comment. The sniper attack on Sept. 12, 2014, and the prolonged manhunt that followed rattled communities throughout the Pocono Mountains. Dickson, a 38-year-old Marine veteran and married father of two, was leaving the Blooming Grove barracks during a late-night shift change when a gunman hiding in the woods across the street shot him twice. Trooper Alex Douglass was just arriving when a bullet shattered his pelvis. He was critically wounded but survived. Identified as the culprit, Frein led police on a tense, 48-day manhunt over rugged terrain before U.S. marshals caught him outside an abandoned airplane hangar, about 30 miles from the shooting scene. Prosecutors say Frein spoke of wanting to start a revolution in a letter to his parents and called Dickson’s slaying an “assassination” in a police interview after his arrest. Frein told authorities he wanted to “wake people up” and “make a change (in government),” according to a police affidavit. Defense lawyers are trying to get Frein’s videotaped confession thrown out, arguing police violated his rights by continuing to interrogate him after he told them he didn’t want to “answer questions about crimes.” Police have said Frein was informed of his right to remain silent but agreed to cooperate. The defense also contends police should have told Frein his family had hired an attorney for him the night he was captured. Courts have generally ruled that police aren’t required to tell a suspect that an attorney is seeking to speak with him or her. A judge will hear arguments on the suppression request after a jury is selected. Even if prosecutors can’t use the confession, authorities have said they gathered plenty of physical evidence tying Frein to the crime, including spent shell casings in his SUV that matched those found at the crime scene. They also recovered a journal allegedly written by Frein in which the gunman describes how he opened fire on two state troopers — watching one of his victims fall “still and quiet” — and then made his escape. If Frein is found guilty, the defense plans to call an expert who will testify during the penalty phase that Frein has had a “mental infirmity” since childhood. His lawyers have not elaborated on the infirmity. Due to blanket news coverage in northeastern Pennsylvania, the jury will come from the Philadelphia suburbs. Opening statements are scheduled for early April. The Dicksons plan to attend as much of the trial as they can. Darla Dickson said she sees her slain son in his children: 10-year-old Bryon Dickson III, who took up the trumpet, just like his dad, and possesses his intelligence and quick wit, and 8-year-old Adam, who has the same well-developed sense of humor. “They’re resilient. Sometimes I think they channel their father, which is a good thing,” she said.